We're open: Monday-Saturday 10am - 5pm and Sunday 11am - 3pm Why not pay us a visit! Don't worry if you get lost, call one of the team on 01204 846677 and we will guide you in! FREE PARKING OUTSIDE OUR SHOWROOM OVERFLOW CAR PARK AT REAR OF MILL. Leave the M61 at junction 6, then at the roundabout take the 1st exit onto the A6027 signposted Bolton, Horwich, A673. At the roundabout take the 3rd exit onto the A6027. At the Beehive Roundabout take the 3rd exit onto the A673 signposted Bolton. Turn left onto the A58 signposted Bury, Blackburn. At the roundabout take the 2nd exit onto the A58 signposted Bury, Blackburn A666, Burnley M65. At the traffic signals turn right onto Halliwell Road (A6099) signposted Town Centre, Halliwell. Look out for the 'Falcon Mill' tower on the left-hand side and after 400 yards turn left onto Handel Street - there is a Bet Fred betting shop on one side of the turning and Whiteside's Fish and Chip shop on the other side. The shop entrance is on Handel Street and is clearly marked, with roadside parking and a large car park at the rear of the Mill. Disabled access is available at the side of the Mill, which can be opened by calling us 5 minutes before arriving on 01204 84 66 77. Leave the M60 at junction 15, then join the M61 motorway signposted Preston, Wigan, Bolton. Keep in the right-hand lane then continue forward onto the A666 signposted Bolton. At the traffic signals continue forward onto the A666 signposted Blackburn, Burnley. At the traffic signals (with Mercedes Benz garage on your right-hand side and Citroen garage on your left-hand side) turn right and then keep in the left-hand lane signposted Smithills Hall & Country Park. 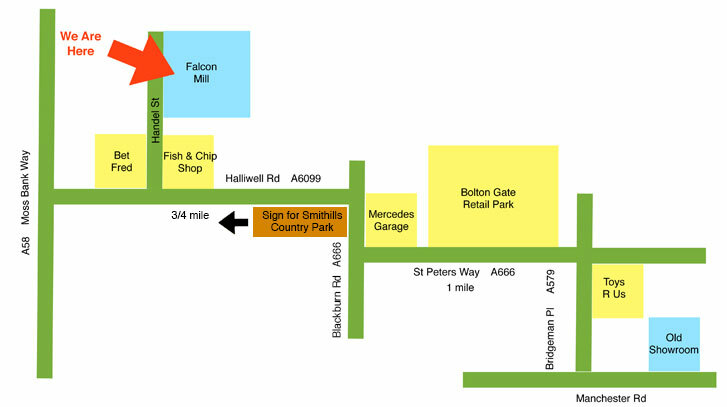 Turn left onto Halliwell Road (A6099) signposted Smithills Hall & Country Park. Look out for the 'Falcon Mill' tower on the right-hand side and after 3/4 mile turn right onto Handel Street - there is a Bet Fred betting shop on one side of the turning and Whiteside's Fish and Chip shop on the other side. From Manchester Road (A575), facing north, turn right on to Bridgeman Place, signposted Blackburn. Keep in the left-hand lane and turn left on to St. Peter's Way (A666) signposted Blackburn, get in to the middle lane. Don't worry if you get lost, call one of the team on 01204 84 66 77 and we will guide you in!